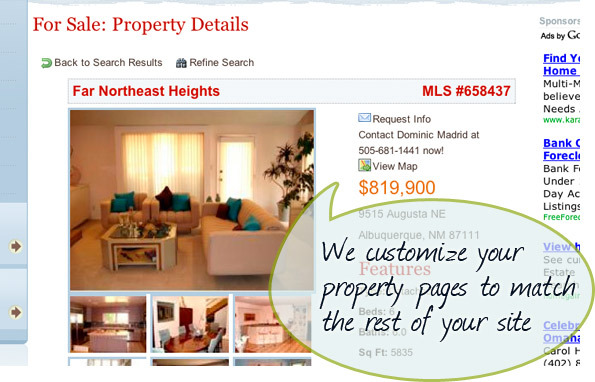 Real Estate Websites by MIS, Inc.
Are you a Realtor in Albuquerque or Santa Fe? Using our RealtyEngine service, you can easily have all of the MLS Listings on your website. RealtyEngine’s IDX solution works with any website and allows your visitors to search through all of the MLS listings and see your upcoming open houses. The Real Estate business is constantly changing and now more and more people are doing their initial property research on the Internet. If your site is the one that helps potential buyers find the property they want, they’ll be more likely come to you when it’s time to buy. We will work with your MLS provider to put thousands of IDX properties (for any city the United States) on your site, seamlessly integrated with your brand identity (using the particular fields you want people to be able to use in their searches), no matter where your site is hosted. With our IDX tool, your listings will always be current and up-to-date. Twice a day, new data will be downloaded from your MLS provider into your site. Your site stays dynamic, your listings stay fresh, and you don’t have lift a finger! Get the most out of your Real Estate business by offering all of your area's listings and by being able to feature your own. Monitor your traffic through advanced statistics and know your visitors. Generate leads by sharing on social media or by your visitors own sharing of your listings. Feature listings anywhere according to your site design. New websites or existing websites. Be contacted on any listing. Advanced and specific search options. And many more easy to use features! Visit RealtyEngine to keep up to date with the latest. Drop us a line to get started or request an estimate. We will likely suggest an in-person meeting to help us get to know you and to help us get a sense for your individual needs as a Realtor.